I have downloaded and installed the eval version of Glasswire. I really like what I see so far. Q: Will Glasswire track the total amount of traffic in\out from other devices such at Tivo and Roku? All I need is data used of each device; ideally a total amount and incremental tracking (hourly, daily, month,etc). The reason I am evaluating Glasswire is because xfinity sent me an email warning that I was about to exceed 1TB of data usage for the month, but they don’t provide any details other than monthly total (951GB out of 1TB). Historically I use less then 500GB per month. I have no idea if there was a massive download like Windows updates, or maybe I left a streaming app running for several days and didn’t know it. It could be a combination of problems, but it currently impossible to know anything more than the monthly total. GlassWire can show you what other devices are on your network under its “Things” tab, but it cannot see their data. To see their data usage stats we’d have to access your router, and GlassWire can’t do that currently. Meanwhile many people use GlassWire to stay under ISP and Satellite data usage plans because most of the time the devices that will push you over your data plan are PCs. 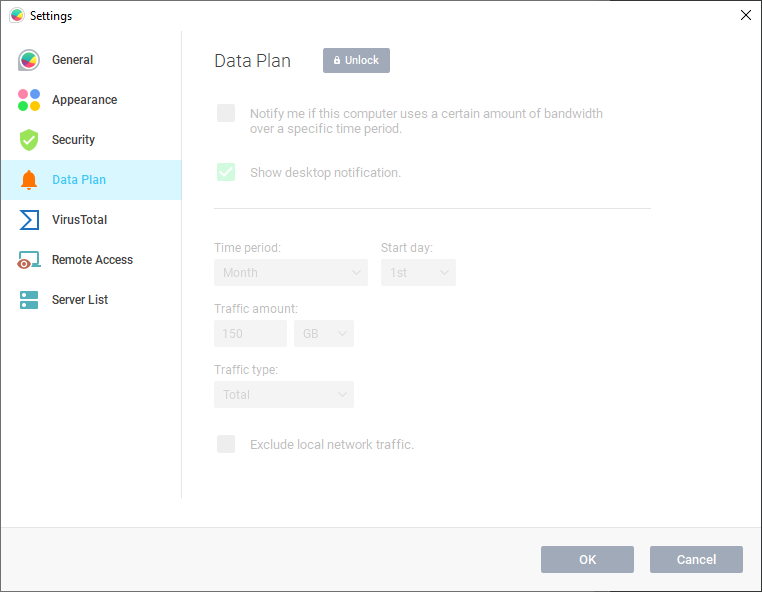 Then GlassWire shows you in detail on your PC what apps/hosts are using all your data and lets you block those things. Thanks for reply. The reply itself provides extra incentive to purchase Glaswire. I am planning to purchase Glaswire unless I can find an complete solution that is affordable. I’ve become aware I can spend $200+ to get a new router with most of functionality I want, but if I am going to do that I need to do additional research to find a good one that doesn’t require me to have professional Linux command line skills and\or CISCO certification knowledge. I actually enjoy tinkering around with small private networks and routers, but for this particular project, I just want something that works and is low maintenance. We also have a data plan feature that may be useful. Just go to our top left settings menu. I’ve subscribed, seem worth trying for a year while I find a complete solution that allows me to track data usage for all my network devices. @nrnoble Thanks for your support! For tracking date usage from all devices on the network I am testing out OpenWRT on my personal router with bandwidthd added. bandwidthd tracks all devices (roku, Tivo, iPad, cablebox, computer, etc), viewing historical data use in a browser. For me, its looking like the biggest use is coming from streaming from Netflix on my Tivo). Glasswire helps further identifying the applications on my computers are using a lot of data.